The Ocho (the 8th). The only band listed that did not play was Loudness, which Metal Sludge confirms was due to being denied entry into the U.S. 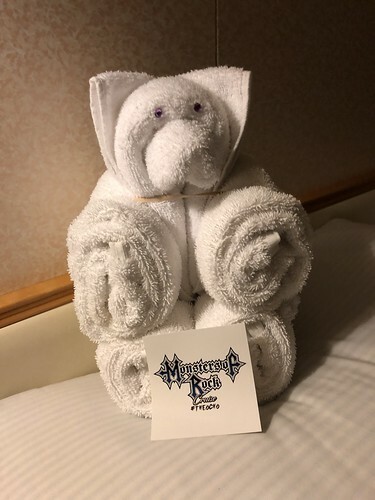 The 2018 Monsters of Rock Cruise was yet another fantastic vacation in the slew of well-organized On the Blue concert cruises. 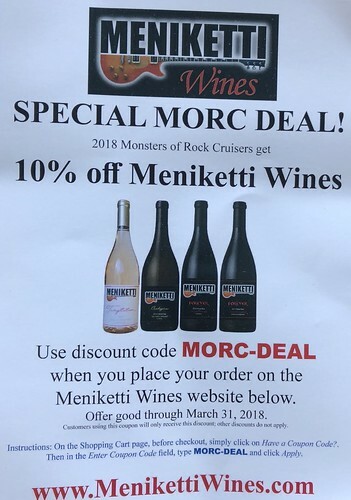 I have been lucky enough to be able to seek my personal respite, reprieve, hiatus – whatever you want to call taking a breath of life as it should be once in awhile – on seven of the eight MORC cruises. It’s never been the same vacation twice, yet it’s always the same merry mix of living it up and chilling it down. This year’s atmosphere was particularly steep in one heartening aspect, one that I’ll happily admit seems to come with aged wisdom: a permeating, profound sense of gratitude for life, music, good friends, and good times in a one-big-happy-family kind of love. The musicians emanated it over and over with both words and energy, and the appreciation flowed. Balcony sunrises and coffee = life is good. Weather-wise, it was mostly sunny and pleasant. However, this year was also rather windy in a lovely sort of way; I personally enjoy the rocking (no pun intended) atmosphere. In fact, I sit here at my desk the day after disembarking and still feel like I’m rocking – an odd sensation yet a pleasing reminder. Royal Caribbean/Navigator of the Seas-wise, there was an impressively nice and helpful staff, from the porters to food and bar to crew and everyone in between. 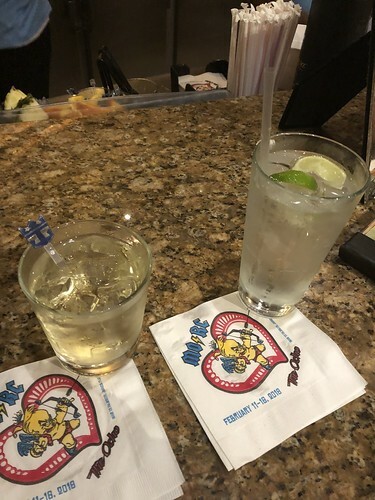 Food and drink-wise, it was typical and somewhat neutral cruise fare (give me a salad bar and I can eat anywhere, although I did indulge in nacho cheese covered chips and Johnny Rockets). 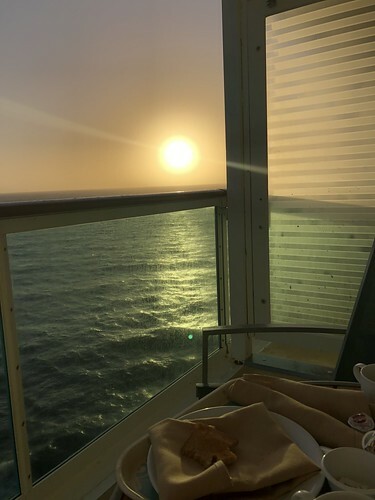 Our level seven balcony room was awesome – I got my coffee delivered for sunrise patio sipping every morning, and followed it up with ocean-breezy yoga to kick off the day. 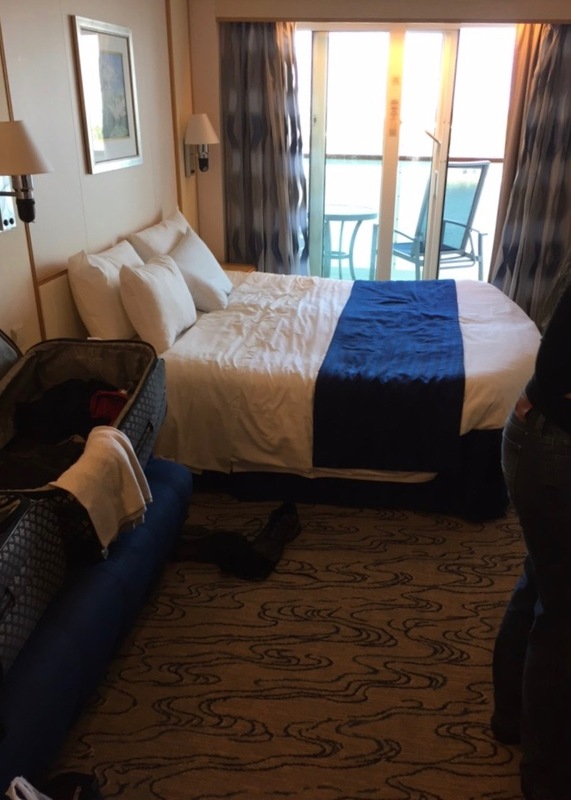 Our seventh level balcony cabin seemed roomier than past cabins. Time-wise, I loved the extra fifth night this year – it seemed to provide for a little more downtime in between shows. The four-nighters of the past always left me wishing for a little bit more. Also, by the time I woke up on Day Six, home was sounding pretty good. I also loved the Sunday-Friday cruise schedule, with the weekend to do some serious recuperating before going back to the grind. Pool Stage – The biggest difference this year was the pool stage; unlike previous main stages, it was a more intimate set-up. It worked well for band Q&As and lesser-attended shows, though there were plenty of roomy upper-decks for watching when it got crowded. It ended up working out quite well as it would have been too windy for the big shows, and I can understand the need to be prepared for rain. But how I cherish those seaside pool stage shows of years past ;o). Studio B – My favorite venue by far. I heard someone in the elevator say that Studio B was meant to be the “pool stage” of past years and it was the perfect description. A big stage with a big general admission area – there really wasn’t a bad spot in the place. The sound was great. A bartender told us it was an ice skating rink on “regular” cruises. Chilling out before a show at the Pool Stage with a tasty Bloody Mary, my favorite morning-vacation-day beverage. Metropolis Theatre – Generally like past theaters…roomy, easily accessible, easy to see from everywhere, great sound. Of course mainly a sit-down theatre, though there was room to stand and jam out when the feeling stuck. I mean, how can you SIT during a Kix show? But even I like to sit sometimes, rare though it may be. Star Lounge – This bar became known as the place where you could hear but not see. 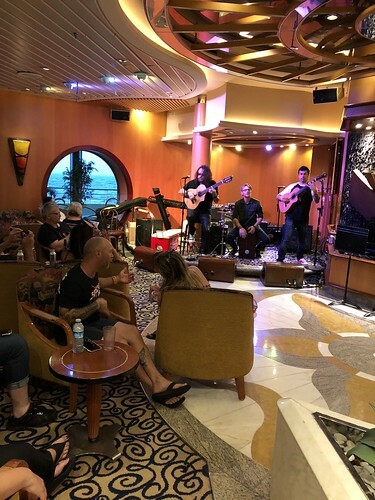 There has been a setting like this on every cruise, more lounge-y bar than concert venue due to the floor-level stage that blocks the band to everyone who isn’t standing up front. But it was a decent place to go in and find a seat and socialize and listen. Most of the bands that played here also played a second show in Studio B.
Boleros – Another cruise standard: a small, intimate stage in a main hall bar area. It’s always a cheery bonus to stop and see whoever is playing these shows as you wander around the ship. This year’s star Boleros stage presence was Heavy Mellow, which plays hard rock and metal standards on spanish guitars. Two Poets Pub and Viking Crown – I didn’t end up at either of these venues, although I saw it flowing at the gills for Heavy Mellow, and when Eddie Trunk hosted his live show on SiriusXM every afternoon. Viking Crown featured Brian & Izzy’s Late Night Karaoke, Cooking for Rockstars, Dave Rude’s Guitar Clinic, photo experiences, a cocktail contest, an auction, and, apparently, edible tattoos on Valentine’s Day. People always ask. It’s hard to say when there were so many enjoyable shows, but best-in-show to me was Lies, Deceit & Treachery, with L.A. Guns coming in at a close second, and Madam X in the top mix somewhere. 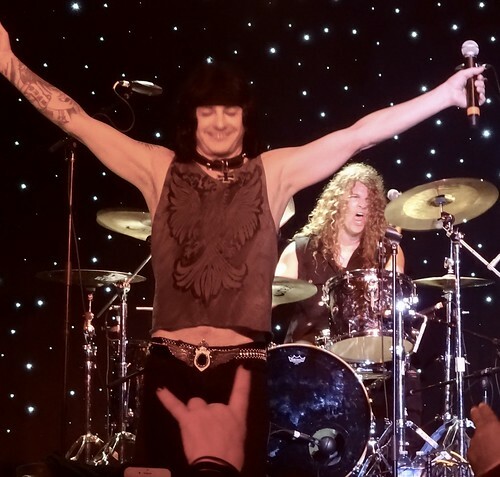 LD&T is made up of the original Bullet Boys band, including my favorite-drummer-to-watch Jimmy D’Anda, and singer Andrew Freeman, whose vocals I lovelovelove singing Ronnie James Dio songs in Last in Line. 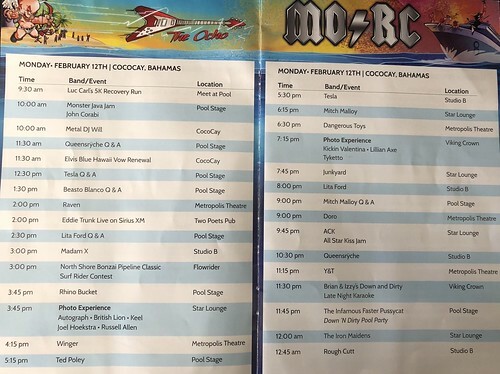 Only on the MOR Cruise can you see a kickass concert at 11 a.m.
MORC hosted pre-shows on Friday and Saturday night before Sunday’s departure. I only made the Saturday night show; once again, I simply couldn’t add a party night on the front-end of the trip. 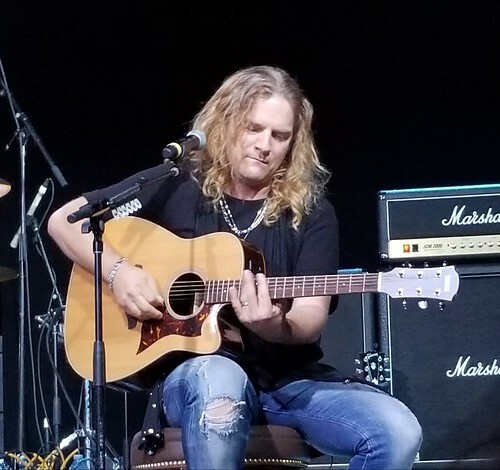 We arrived at Magic City Casino right as Y&T started and it was a gorgeous Florida winter evening in a spacious outdoor venue. The sound was fantastic yet oh-so-loud. Yes, I know, if it’s too loud you’re too old, and yes, I suppose I’m old but I have enough hearing problems so I never went anywhere without my high-end ear plugs strung about my neck (side note: I’m still open to finding the absolute best concert ear plugs if anyone has any suggestions). As usual, Y&T put on a first-class show. And I think I love Queensryche now more than ever…I love to hear them play nowadays, the songs sound so good and the energy is so complete. And I’d like to thank that guy, whoever he is, that left the Rage for Order cassette in my car back in 1986 because that’s how I got into this band. 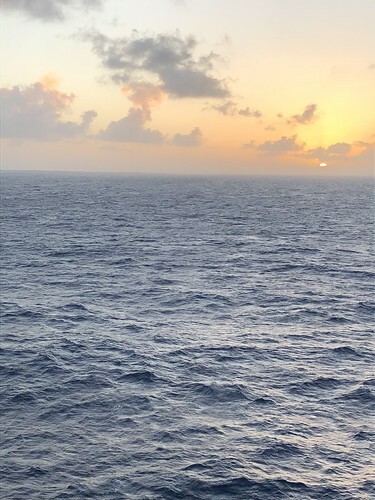 Our view of the Sail Away Photo Hosted by Eddie Trunk. 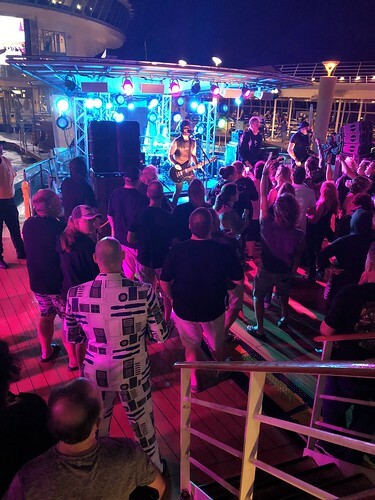 I often wonder what average cruise patrons and port employees think when the several thousand long-haired, tattooed, skull-wearing, cleavage-bearing, black-clad assortment of young and old rockers congregate at the port, all happy to be amongst Their People. I imagine they wish they were going to have as much fun as we were about to. 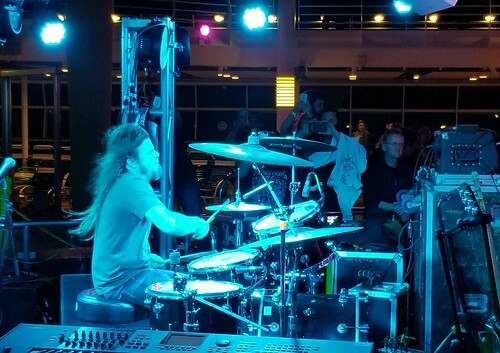 On Sunday we checked out the Jared James Nichols sail away jam session, Kix, Lynch Mob, Heavy Mellow, Kickin Valentina, Autograph, Keel, and Tyketto. 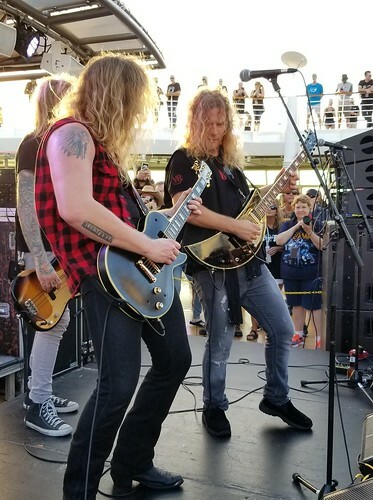 Jared James Nichols jam session sail away show with Frank Hannon of Tesla. One should never miss random jam sessions on the cruise, you never know who will show up where. Photo by Michelle Cormier Lewis, diehard Tesla fan. 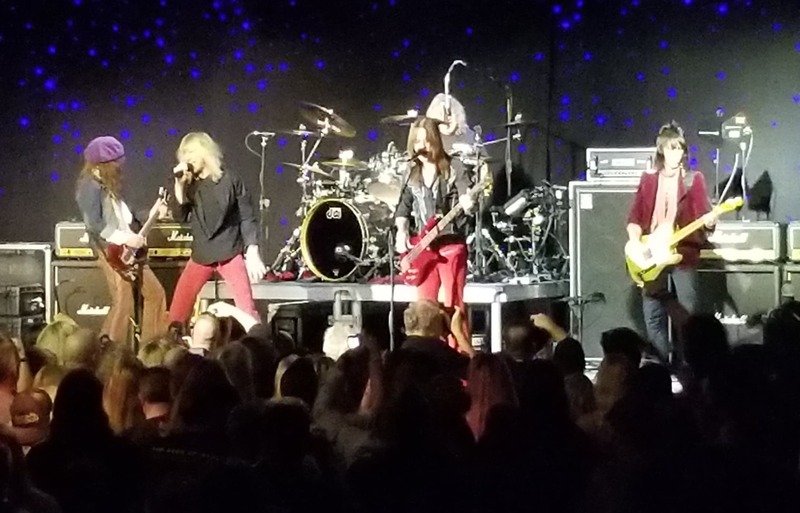 Kix played two packed shows, one in the Metropolis Theater and one in Studio B. Both were their customary high-energy funfunfun concerts, with Steve Whiteman having his usual easy crowd conversations, talking to the audience like he’s talking to friends. Ever since my pal from the L.A. days Brett Miller explained the vocal situation going on here, I always notice the amazing choral connection taking place between Steve and drummer Jimmy Chalfant. A band that never has an off show. Here’s a video of Lynch Mob in Studio B. I wondered who would be singing given the recent depressing departure of Oni Logan from the band. Like I said in my review of last year’s Lynch Mob show, these guys had just got their band chemistry to a really good place. They ended up bringing back old vocalist Robert Mason, who now sings for Warrant. According to Blabbermouth.com, Robert will be doing a few shows with Lynch Mob, but they’re not trying to steal him away from Warrant. George Lynch and Sean McNabb were great, and were very visible, friendly faces around the ship. My favorite drummer boy Jimmy D’Anda was replaced by Scot Coogan, presumably because Jimmy has reunited with his Bullet Boys bandmates in Lies, Deceit & Treachery. Kickin Valentina in the Star Lounge. I kept hearing about this band over the past few months so I looked them up on my cell phone at work one day and they have a very cool sound – and I’ve got to mention they have the best cellphone-sounding mix ever. Good stuff. Photo courtesy of Kimm Shaw, upfront fan. Keel in the Metropolis Theatre. 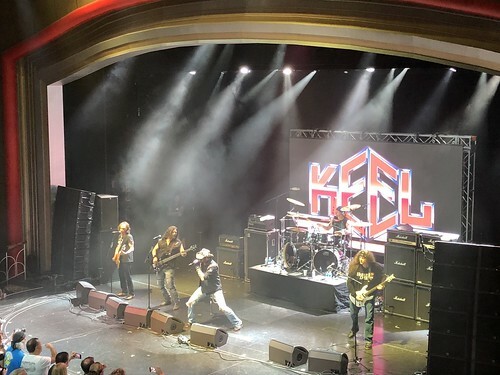 While I remember Ron Keel from the L.A. days I wasn’t really familiar with their music, though one of my cruise pals loved their album in high school. Decent show, choreographed moves and all. One song I noted for its lyrics: “I said the wrong thing to the right girl…” Ha. I “discovered” Tyketto on the MORC several years ago and lovelovelove them…Danny Vaughn‘s voice is pure joy to the ears. See a video from the second show below. 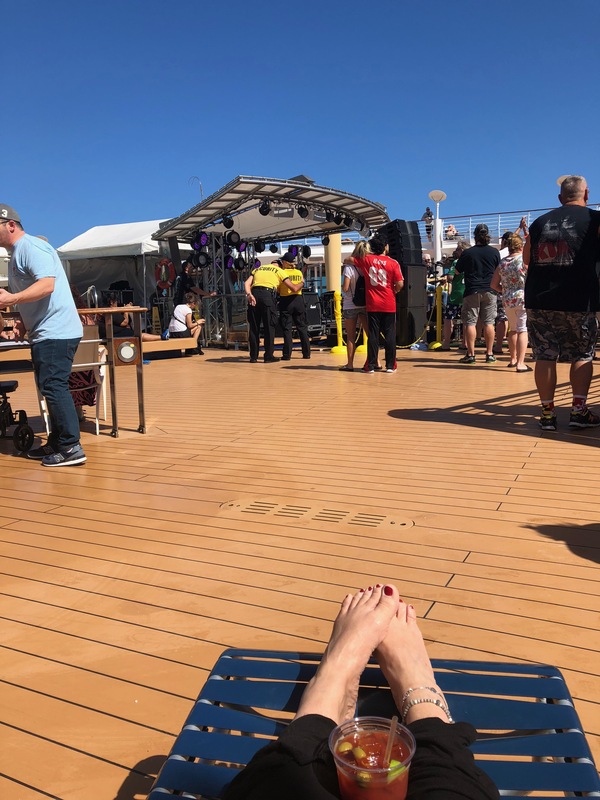 The day started out with an always-enjoyable John Corabi jam on the pool stage, and from there we tendered over to the scenic port of CoCoCay, Bahamas. The ship was originally scheduled to stop in Falmouth, Jamaica, but due to some sad civil unrest in that country it was moved. We sat in the island sunshine with frothy cocktails, had lunch, and checked out a bit of acoustic Budderside. 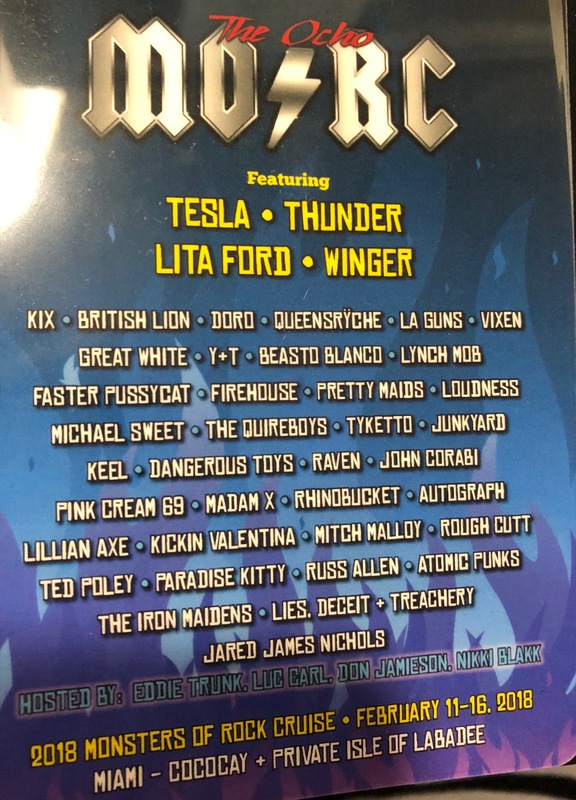 Headed back and watched Raven (who I did not know), then on to Madam X, Rhino Bucket, Winger, Tesla, Junkyard, Lita Ford, and Doro. 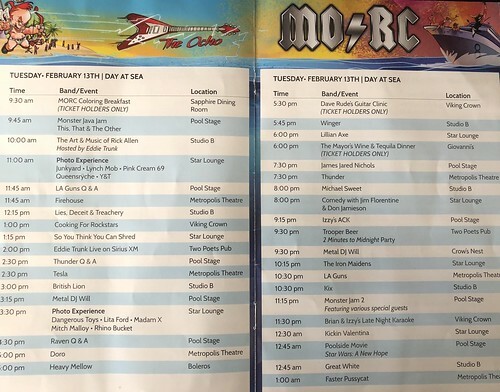 What a day – and then Queensryche, Y&T, Faster Pussycat, the Iron Maidens (female tribute band), and Rough Cutt all played late shows that even a triple-shot of espresso couldn’t fully support. 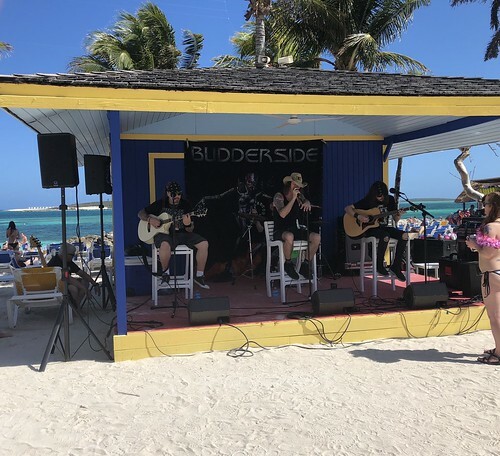 An acoustic Budderside show on the island port of CocoCay, Bahamas. 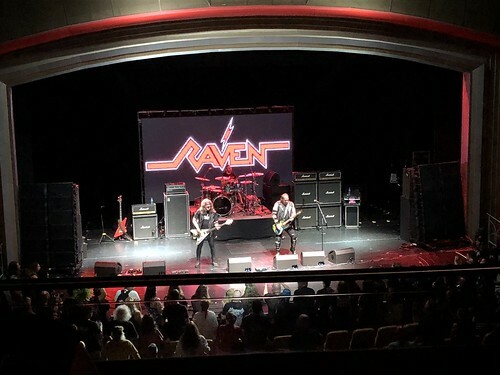 Raven in the Metropolis Theatre. I wasn’t familiar with them but they seemed to have a decent following, and they have a pretty humorous ’80s video on YouTube (check out On and On). The heavy three-piece British band played a “love song about killing with a large military arsenal” and dedicated one song to their mailman, who was in the crowd. Fun stuff. 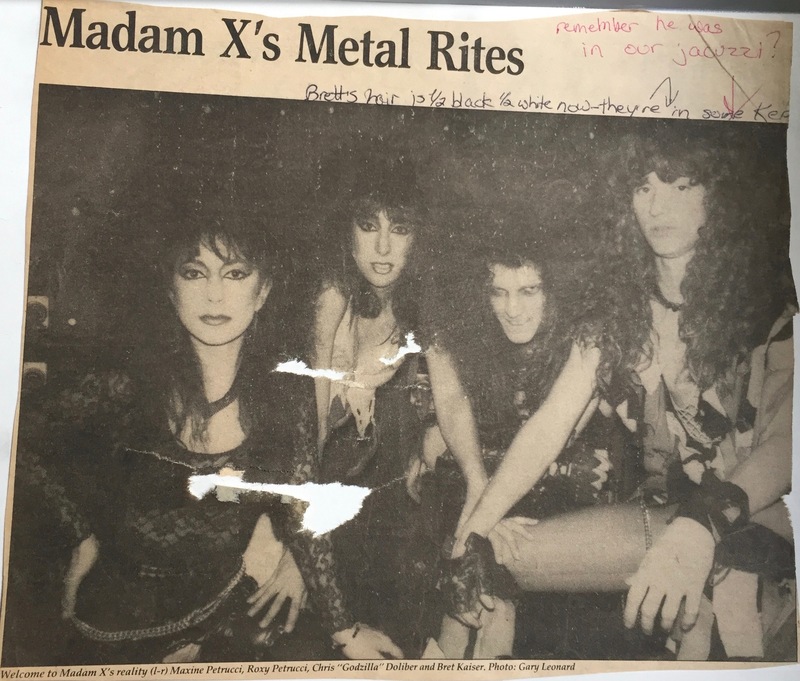 Madam X was the only band that passed out show fliers (that I know of anyways) – gotta love the old-school work in that. The bass player (to the left), known as Godzilla, was handing them out Sunday night outside of Studio B. They put on one of my favorite shows! They have great songs, great to watch, the singer consistently hits perfectly enjoyable ’80s high notes, great back-up vocals, Roxy and Maxine Petrucci are amazing, and they JUST MAKE ME HAPPY to watch. And they passed out shots during their show! Love this band, so much fun, I hope they tour. I’m listening to their 2017 album Monstrosity on Apple Music now as I write…check out this review on sleazeroxx.com. As an aside, someone mentioned to me singer Bret Kaiser does an Elvis tribute. So, bonus…this clipping was in my ’80s L.A. band flyer memorabilia, and a friend noted up top that we sat in a hot tub with someone from this band. I’ve got nothing in the memory banks on this, but have always found it to be a fun non-memory. Rhino Bucket on the Pool Stage. Loved this show! 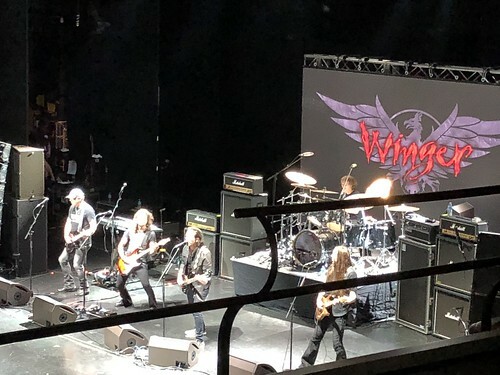 Winger in Metropolis Theatre. We saw Kip everywhere we went. Tesla acoustic set in Studio B. Great photo by Michelle Cormier Lewis. Rick Allen of Def Leppard joins Tesla. Photo by Michelle Cormier Lewis. Frank Hannon of Tesla, feeling the song. Awesome photo by Michelle Cormier Lewis. 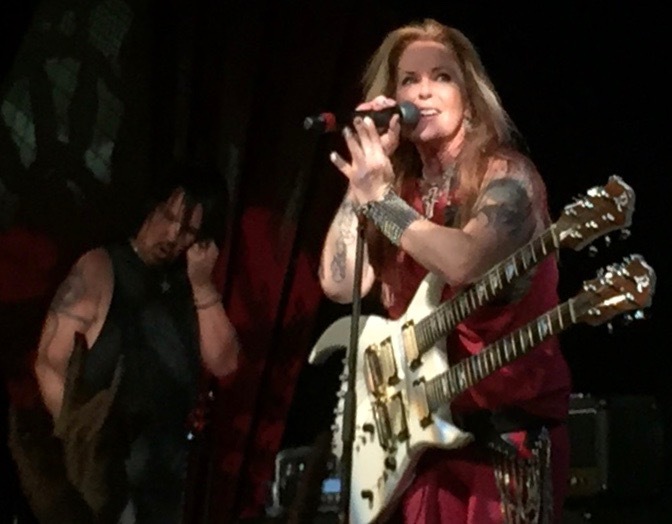 Lita Ford in Studio B, with guitar player Patrick Kennison, who really adds a lot to this band. Doro in Metropolis Theatre. Very heavy show! 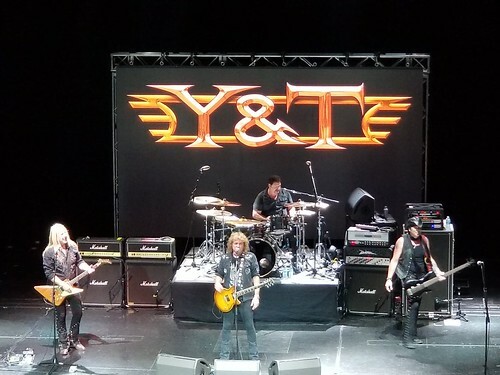 Y&T in the Metropolis Theatre. 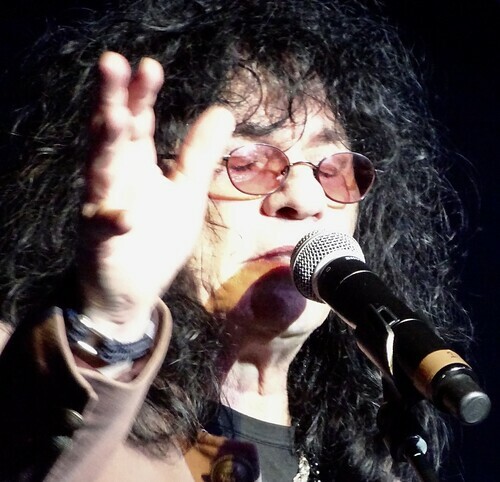 Another great photo by Michelle Cormier Lewis. 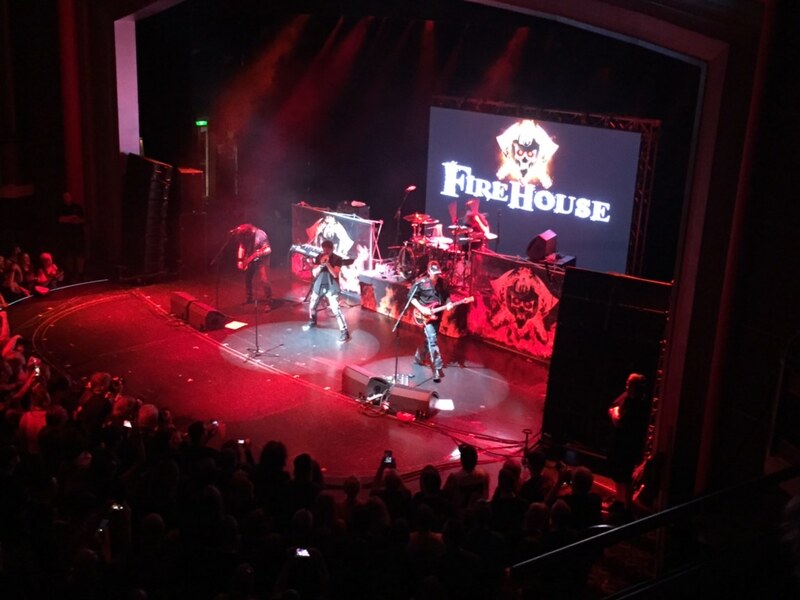 A rather mellow morning followed by Firehouse, then my number one show pick Lies, Deceit & Treachery, Tesla, Heavy Mellow, Lillian Axe, Jared James Nichols, Thunder, Izzy Presley’s ACK (Ace Frehley tribute band), L.A. Guns, Kix, and Monster Jam 2. Firehouse in the Metropolis Theatre. This video is of the first song by Lies, Deceit & Treachery which set the tone for the whole kickass show. We spoke with Jimmy D’Anda for a few minutes in the cafeteria later and he was so appreciative and thankful of our praise, and said the band felt the chemistry too. Seems like a cool guy. I hope they tour. Heavy Mellow in Boleros. These guys play mind-blowing Spanish guitar versions of metal songs. 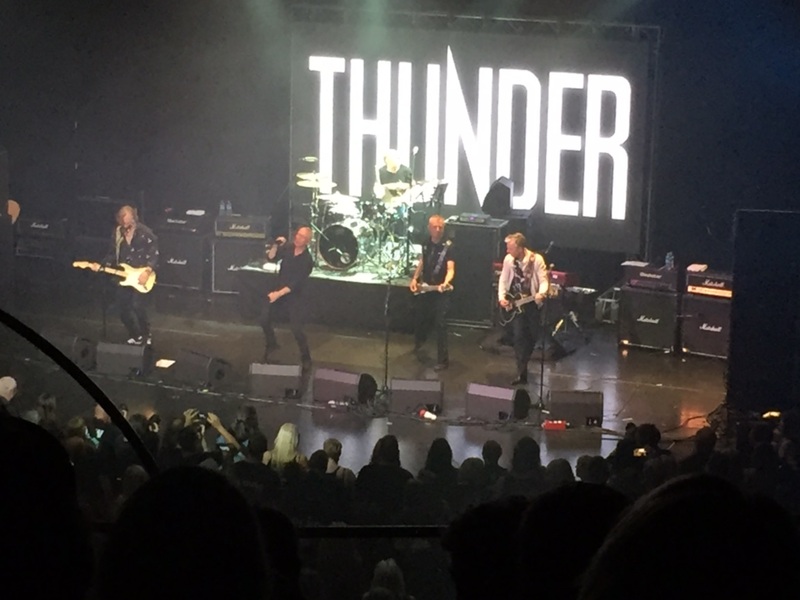 Thunder in the Metropolis Theatre. They waited to play their two hits until the end, and still seemed surprised that Dirty Love and Loved Walked In were hits in America. Sounded solid. 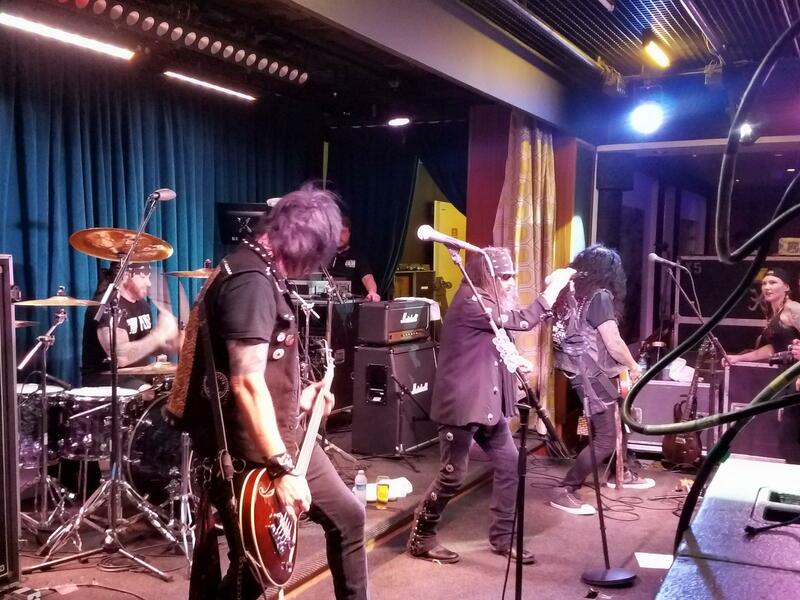 Izzy’s ACK, an Ace Frehley tribute band and jam session on the Pool Stage, with Patrick Kennison from Lita Ford on guitar. I don’t always catch who everyone is at these jams (I think I’m right on this photo – the jam sessions kind of meld together in my memory.) It was also Star Wars night, hence the interesting suit. Queensryche singer Todd La Torre playing drums on the Pool Stage. This picture is from the first of two pool jam sessions but I figured as good a place as any for this cool photo by Michelle Cormier Lewis. As Michelle said, who knew Todd played drums? Wednesday was a beautiful yet sometimes windy day in Labadee, Haiti. 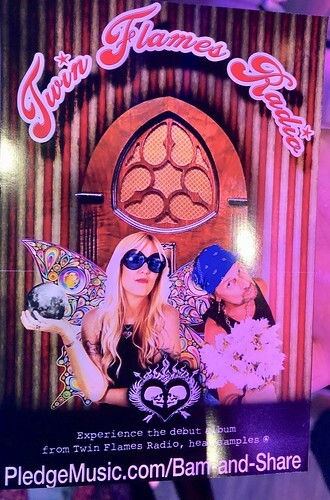 We braved (literally) the local shops and got a few trinkets to support the local economy, watched Jason Beiler do an acoustic set, then enjoyed Atomic Punks (Van Halen tribute band). 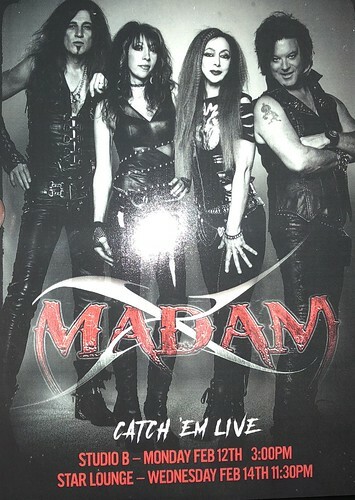 Back on the ship we saw an amazing Vixen show with a variety of guest singers as Janet Gardner was recovering from emergency surgery after suffering from a blood clot on the brain. Checked out The Quireboys (forgot how much I liked their bluesy songs), Pink Cream 69, another great Tyketto show, second-in-show pick L.A. Guns, and then a bit of Beasto Blanco. The calm lagoon side of Labadee, Haiti. The rough and rocky side of Labadee, Haiti. 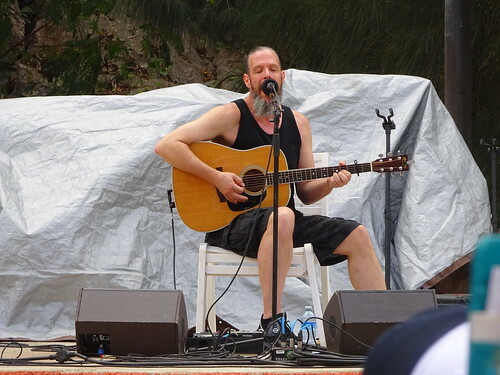 Jason Bieler from Saigon Kick in Labadee. Not only a talented dude but a fun guy to follow on social media. 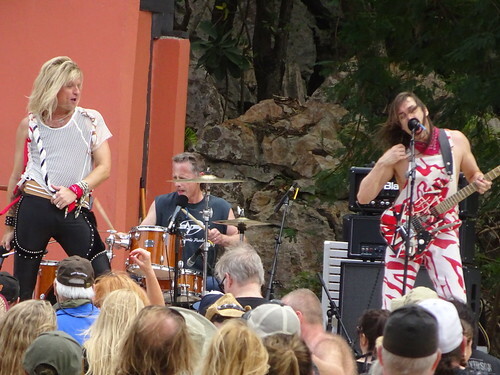 Atomic Punks in Labadee, Haiti. 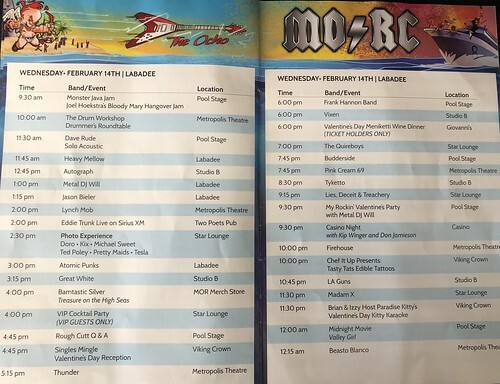 Only on the MOR Cruise can you see a Van Halen tribute band in freaking Haiti. 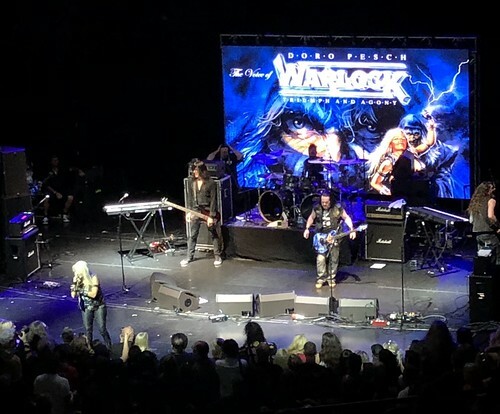 Here’s a video of Todd LaTorre from Queensryche singing Edge of Broken Heart with Vixen (whose singer, as mentioned, is recovering from brain surgery) and a humorous twist featuring all the fill-in singers at the end…loved the love at this show. Phil Lewis and Shane Fitzgibbons of L.A. Guns. A short clip of “our song” as he called it – Tyketto’s Forever Young. RIP, Brittany. L.A. Guns video…such a great, great show. A photo that captures the essence of Beasto Blanco in the Metropolis Theatre by Michelle Cormier Lewis. 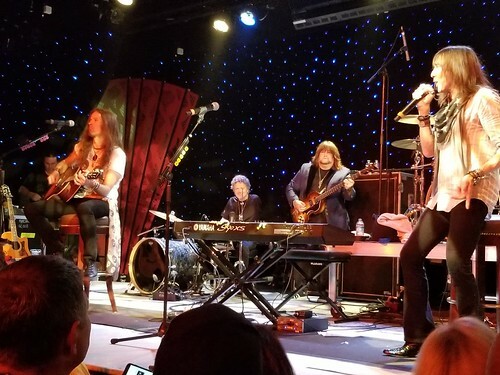 The band features Calico Cooper, Alice’s daughter, who carries on the family’s stage show tradition, as well as Alice’s long-time bass player. I’ll mention that I learned the news about the Marjory Stoneman Douglas High School shooting during this theatrically violent show. 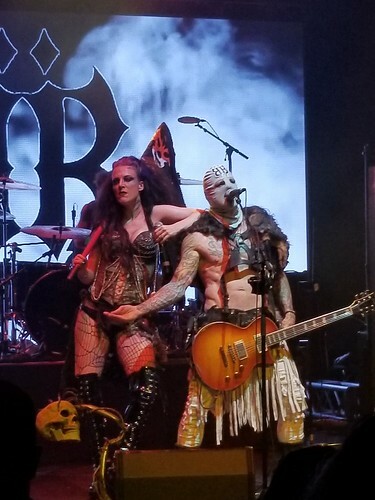 The timing, and the rule that nothing is a coincidence, makes me wonder about the desensitization argument – not that I buy it, but I think the topic calls for a future blog post taking another psychological look at so-called shock rock, death metal, etc. on the younger generation. If you’re into such things, check out my blog post on What Psychologists Say About Metalheads 2016. Last day! After a morning cruise breakfast of a lox and cream cheese bagel, I went to Vixen’s Share Ross’ essential oils seminar in Studio B, where I passed essential oil samples to a fit and healthy looking Taime Downe and his beautiful girlfriend – the seminar was a very cool gem in the whole cruise experience. I’ll just add, for posterity’s sake, that one of the things I do remember from the ’80s is that Taime always went out of his way to go around and introduce himself to people – like at the Rainbow party in the parking lot – and, quite honestly, was the most gracious and pleasant rockstar on the Sunset Strip. Just sayin’. 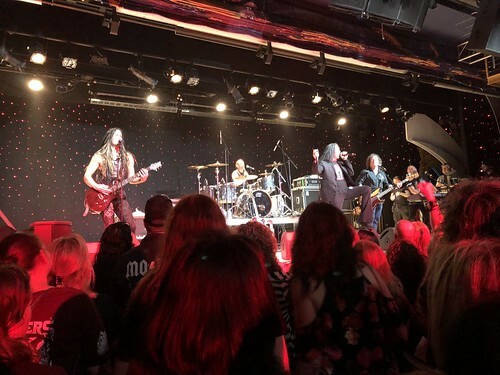 We then checked out “It Came From the Studio” Roundtable with Micheal Wagener (producer), George Lynch, Kip Winger and Mark Weiss (rock photographer) on the pool stage – hosted by Eddie Trunk. There were some good questions and interesting stories. From there we saw Micheal Sweet of Stryper do an acoustic set with guests, took an unexpected nap on a pool lounge chair, then Rough Cutt, a band I was really looking forward to. Finished off the evening with a great Junkyard show and finally Atomic Punks on the pool stage. Share Ross’ (Vixen) PledgeMusic.com flyer for Twin Flames Radio from her doTERRA Essential Oils seminar. 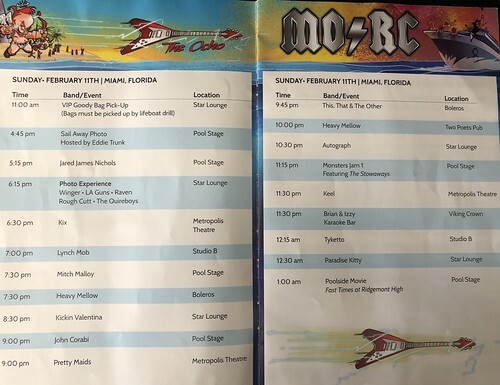 It warms my heart and pleases me immensely to see this kind of stuff in our favorite musicians’ lives and on the MOR Cruise…thanks, MORC! 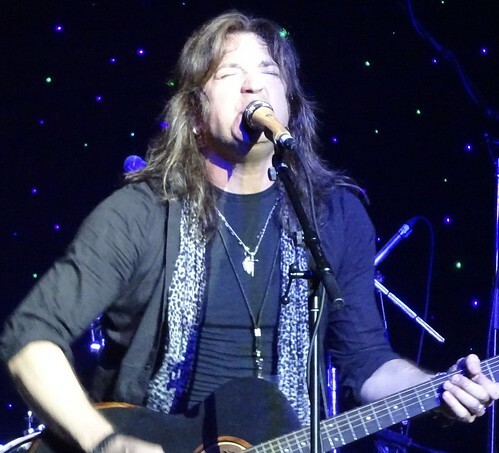 Michael Sweet of Stryper doing an acoustic show in Studio B. 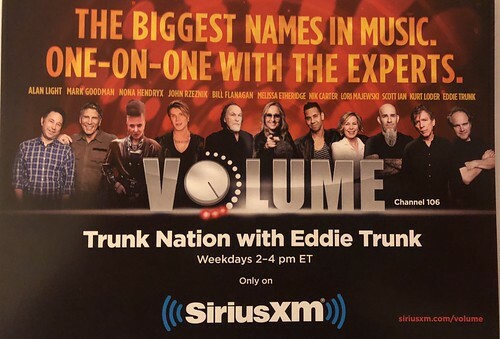 Cool show, with guests Joel Hoekstra and Russell Allen. I didn’t realize he sang on a Boston tour until he mentioned it and sang my favorite Boston song perfectly – Peace Of Mind. Really, truly, all I want is to have my peace of mind. Paul Shortino of Rough Cutt. I loved their debut album and used to go see them back in the day. Junkyard in Studio B. I always think of them as a punk band with melodic riffs and great grooves that pushed them over to the rock side. Love the song Simple Man. 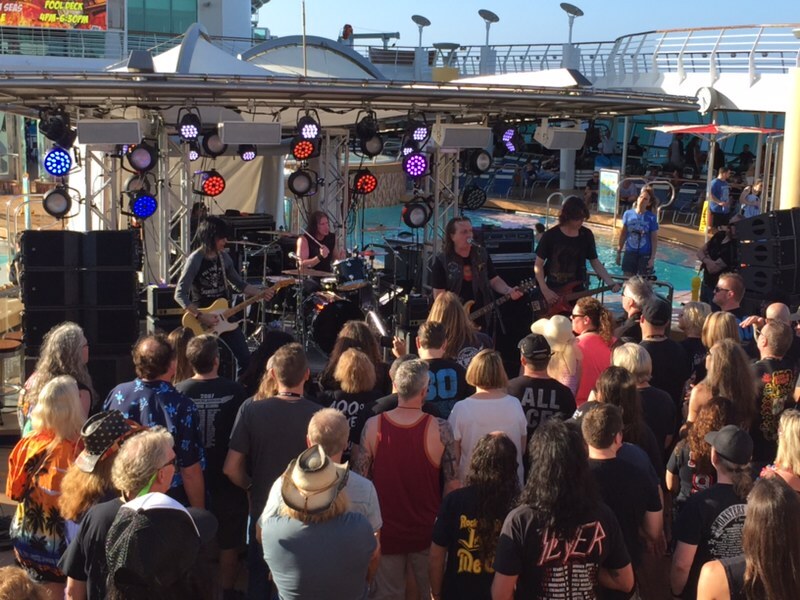 Final show of the cruise – Atomic Punks on the Pool Stage on a beautiful Caribbean night. Tired but happy, we had put our bags out the night before and leisurely made our way off the ship around 9 a.m., and then experienced an insanely thrilling taxi ride in and out of emergency lanes with brake-slamming jerks back into traffic, stopping just short of jumping dirt piles (even though I think the driver considered it once), to the Miami airport. I’ll also mention that I’m glad I wore my new Queensryche shirt home on the plane because singer Todd LaTorre was on our flight and was nice to chat with, so that was cool. All in all, another great cruise and amazing vacation. Life is good. 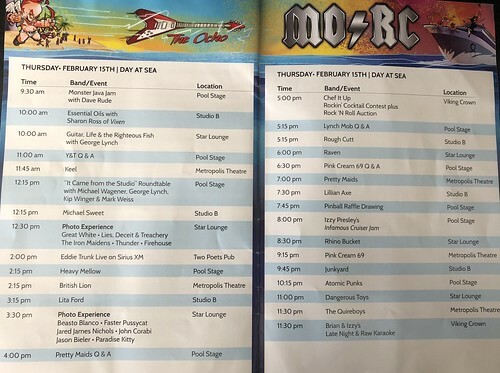 For more MORC videos, check out Grant’s YouTube page here. Copyright 2018. Rocksandy. All rights reserved.